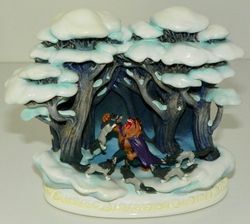 In 2000, Robert Olszewski released the first figurine "Fireside Thoughts" DC-1 to the public returned him to a favorite subject matter for all of us enjoy, classic children's literature. Story-Time was a collection of personal interpretations of classic stories, fables, and nursery rhymes. This collection was designed and produced so that as many collectors, children, parents and grandparents could enjoy and experience those stories. Particular attention was made by Olszewski to capture the essence of the characters and the story, along with making the collection affordable. In 2007, The Harmony Ball Company made the announcement that Story-Time ended December 31, 2006. A listing of the limited edition (LE) pieces and the number produced can be found in the Olszewski Studios Era 1994-Today.